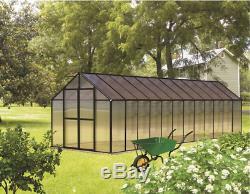 Monticello 8' x 24' Black Greenhouse. Not all greenhouses are built the same and the Monticello line of greenhouses by Riverstone Industries proves this to be true. The Monticello is proudly MADE IN THE USA. Applying good old American ingenuity to make the best product for our customers and help to elevate the industry standards of all greenhouses. Constructed from the highest quality extruded aluminum (US grade not the thinner & more brittle foreign aluminum) and electrostatically painted Black (guaranteed to contain 0.0% lead), our greenhouse uses on average more than 100 lbs. More aluminum than the average imported greenhouse. The weaker the framework the less snow the greenhouse can hold in the winter time before collapsing on itself also the easier it will be get damages in wind. While most hobby greenhouses on the market us less expensive thinner walls and roofing materials the crystal clear walls are as thin as. 2mm, the Monticello uses professional grade 8mm twin wall polycarbonate. This is the same thickness as used in the commercial greenhouses. The twin wall polycarbonate acts as a double pain window keeping cooler air in during warm months and insulating the greenhouse from cold air in the wintertime. This not only makes the Monticello more efficient to grow in for a longer period of time than other greenhouses but it also adds to the efficiency of growing, cutting down electric bills for those who choose to grow year round. With the average greenhouse on the market today taking a solid weekend to assemble it is easy to see why so many greenhouse owners say that the top issue in the first 2 months of ownership is the actual set-up. We listened to the owners and took the construction process into consideration when designing the Monticello. Through a combination of using superior materials that are more rigid and creating interchangeable parts in our design the Monticello takes the average. Hours to assemble the 8ftx8ft greenhouse while using much fewer parts. This does not include the base prep work needed, which includes leveling the ground. At 7ft 6in tall at the peak the Monticellos above average interior height design also helps with displacing heat within the greenhouse while also allowing for the tallest gardeners not to have to bend down when inside the greenhouse. From the integrated base to the built in rain water gutter system, to the automatic roof vent opener and. The newly redesigned HINGED DOUBLE DOORS with an opening of almost 6ft high x 4 &. You are sure to enjoy the Monticello greenhouse for years to come. You get what you pay for and with the Monticello this rings true. On the frame and Polycarbonate. For the gardener that is looking for a mid-priced greenhouse system that will supply years of hassle free indoor gardening this is the greenhouse for you. We hope you enjoy growing in the Monticello as much as we enjoyed designing it. PROUDLY DESIGNED & MADE IN THE USA! W x 24.5 ft. L x 7.6 ft. High impact UV stable 8mm twin wall polycarbonate walls and roof. Heavy duty extruded aluminum frame construction. 5 - 2ft x 2ft roof vents with automatic openers. Integrated dual rain water gutter system. Large 5.10ft x 4.6ft wide door opening. New Patent Pending Twist & Lock single bolt (makes assembly quicker and easier over prior version) (NEW for 2014). Accessories available including shade clothes, watering systems, potting sinks, & shelving kits. Expandable ability to expand greenhouse in 4ft increments as needs grow. Snow load capacity of 24lbs/sq. Wind load of 52 m/sec (113 mph gusts). Please Note - Allow for a FULL weekend to Fully Assemble (ground prep included). Two people suggested for assembly. The item "8' x 24' Black Monticello Greenhouse by Riverstone Free Shipping" is in sale since Tuesday, November 1, 2016. This item is in the category "Home & Garden\Yard, Garden & Outdoor Living\Garden Structures & Shade\Greenhouses & Cold Frames". The seller is "little-land-ind-4-all" and is located in Alapaha, Georgia. This item can be shipped to United States.